Acute lung injury (ALI) is a frequently fatal cause of respiratory failure among hospitalized patients, and a practical and easily obtainable prognostic index at the time of ALI diagnosis is needed for risk prediction. The utility of current prognostic indexes is limited, as they cannot be generated on presentation, and they contain components not routinely available in clinical practice. We developed a prognostic index for in‐hospital mortality using clinical data that is readily available in both mechanically ventilated and non–mechanically ventilated patients on the day of diagnosis of ALI. Using the Validation of Biomarkers in Acute Lung Injury Diagnosis (VALID) study, a large, multi–intensive care unit cohort, we developed a prognostic index from all adults meeting consensus criteria for ALI/acute respiratory distress syndrome (ARDS). We identified 16 clinical variables available in at least 90% of patients on the day of ALI/ARDS diagnosis that were independently associated with in‐hospital mortality and used backward elimination (P < 0.10) to determine which variables remained independent predictors of mortality. Leave‐one‐out cross‐validation was used for internal validation, and coefficients were weighted to create a risk index. The test characteristics of the derived risk index, called “lung injury severity score” (LISS), were compared to conventional prognostic indices. Quartiles of the LISS were then generated to predict mortality risk at each level. Of 629 patients with ALI/ARDS, 24% died during hospitalization. Seven independent predictors of mortality were identified on the day of diagnosis of ALI/ARDS, including age, respiratory rate, systolic blood pressure, pulse oximetric saturation (SpO2)/fraction of inspired oxygen (FiO2) ratio, serum bilirubin, serum creatinine, and platelet count (Table 1). Scores on the risk index were strongly associated with in‐hospital mortality for a maximum possible score of 16 points (Table 1). For each 1‐point increase in LISS, odds of death increased by 40% (OR, 1.4; 95% CI, 1.3–1.5). The LISS risk index showed improved discrimination compared with conventional prognostic indexes (Fig. 1). The C‐statistic of 0.76 was marginally reduced to 0.74 on cross‐validation. FIGURE 1. Receiver operator curves and area under the curve (C‐statistic) for the LISS compared with other mortality risk indexes among 629 patients with ALI [APACHE II, Acute Physiology and Chronic Health Evaluation II; SAPS II, Simplified Acute Physiology Score II; LIS, lung injury score (Murray). The LISS prognostic index, incorporating readily available clinical variables on the day of ALI/ARDS diagnosis, accurately predicts mortality in acute lung injury in a broad ALI sample. The test characteristics in this derivation cohort are superior to conventional risk indexes. External validation of this score is required prior to implementation in clinical practice. 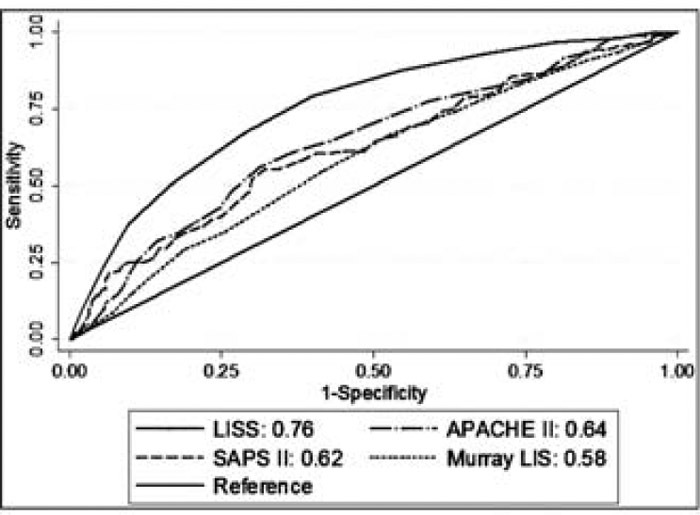 Kangelaris K, Calfee C, Zhuo H, Matthay M, Ware L. The Derivation of the Lung Injury Severity Score (Liss): A Prognostic Index for In‐Hospital Mortality in Acute Lung Injury. Abstract published at Hospital Medicine 2011, May 10-13, Dallas, Texas. Abstract 1002. Journal of Hospital Medicine. 2011; 6 (suppl 2). https://www.shmabstracts.com/abstract/the-derivation-of-the-lung-injury-severity-score-liss-a-prognostic-index-for-inhospital-mortality-in-acute-lung-injury/. Accessed April 25, 2019.